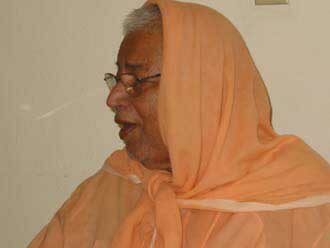 Six amazing dreamlike months have passed by at the Soquel Seva Ashram and we cannot but reminisce on the sweet moments we shared with Srila Govinda Maharaj. Like working bees, we must try to go on, but amidst our daily activities we find ourselves daydreaming about what Srila Gurudev would be doing right now if he was here. The only evidence that his visit was not just a dream are the memories we cherish deep within our hearts and of course, the thousands of photos sitting on our desktops. Here is a presentation of one of the many pastimes that have not yet been displayed on the web. 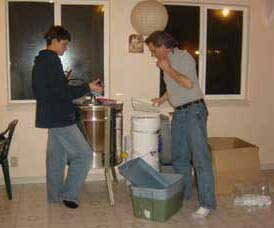 Cultivating honey is a long and step by step process which can take an entire year. 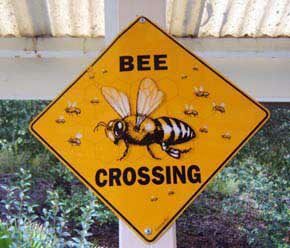 The bees work all spring and summer to collect pollen, convert it into honey, and store it in the honeycombs. 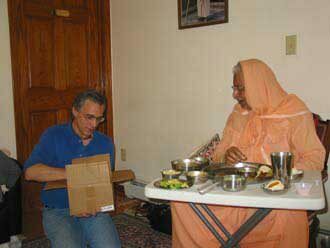 Normally the honey is ready to be extracted at the end of summer but before Srila Gurudev left the Soquel Ashram, Hasyapriya Prabhu arranged a special harvest specifically for the pleasure of His Divine Grace. 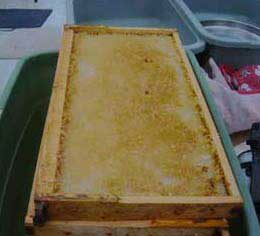 It was a rainy, cloudy day and we didn't expect the honey project to go on in this weather. However, anything is possible when making an effort to please His Divine Grace. Hasyapriya Prabhu, who started the bee project, explains: "By Srila Gurudev's mercy, the land at the Seva Ashram is producing an abundance of fruit from our orchard. Like all of the devotees in our community, the trees, the water from the land, even our honey bees who help pollinate the fruit trees are eagerly offering their 'fruits' to His Divine Grace." 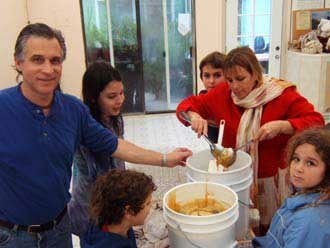 In these photos Hasyapriya Prabhu shares with us the process of making honey. 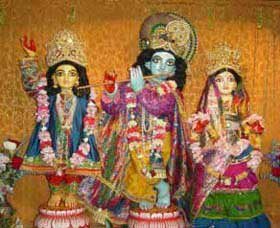 Jaya Sri Sri Guru Gauranga Gandharvika Giridhari! 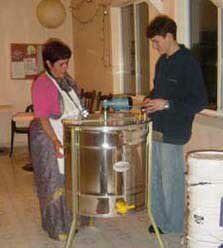 The night before extracting the honey, Gaur Nataraj Prabhu and Hasyapriya Prabhu set up the honey extracting equipment in the prasadam hall. The next day within the orchard the hives are buzzing with bees. 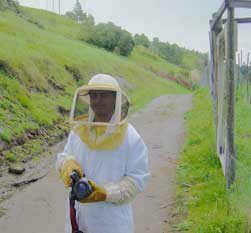 Hasyapriya Prabhu and Gaur Nataraj Prabhu, dressed in their protective suits, prepare to harvest the honey. Ranajit Prabhu suits up as well so he can film and take pictures of the event for Srila Gurudev's viewing pleasure. 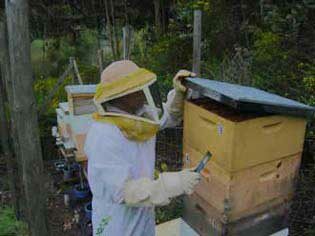 Hasyapriya Prabhu carefully opens the first hive to remove the honey covered frames. 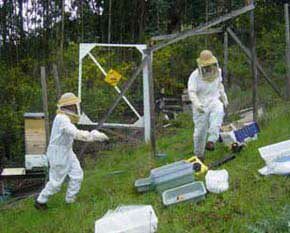 Bees produce so much more honey than they can use thus allowing us to harvest the excess. Each frame holds about five pounds of honey. 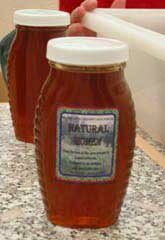 The honey is protected by a layer of wax made by the bees to keep it fresh and clean. 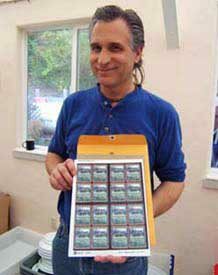 After removing their suits and bringing the frames into the prasadam hall, Gaur Nataraj Prabhu prepares to remove the wax cappings from the frames so the honey can be extracted. 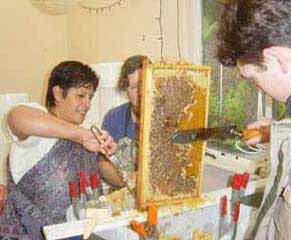 Swarnangii Didi, Kirtida Didi, and Gaur Nataraj Prabhu use hot knives to melt the wax cappings so that the honey will drip out of the cells when placed into the extracting machine. Looking inside the honey extractor Gaur Nataraj Prabhu explains to Kirtida Didi how the blue motor on the top spins the frames. 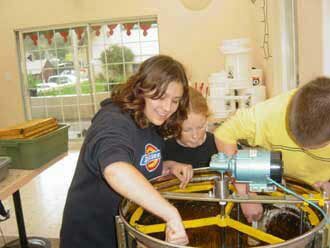 From the centrifugal force of the spinning, the honey is thrown out of the cells and into the base of the stainless steel drum. Jahnavi Devi Dasi, Devaki Devi Dasi, and Nilamani Prabhu place the frames into the machine. 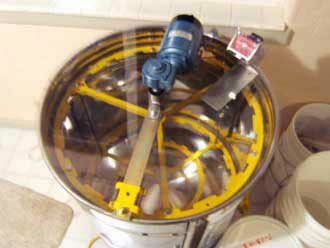 Now the extractor is ready to spin the frames. 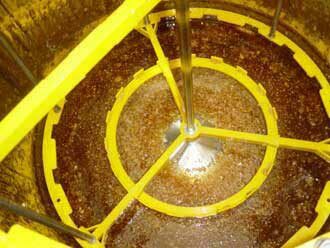 Once the empty frames are removed, the honey flows to the bottom of the drum. 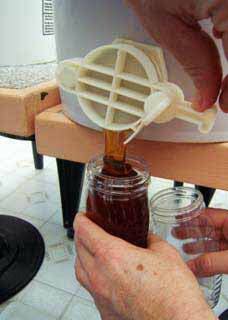 The valve is opened and the honey, along with bits of wax, pours into the strainer. 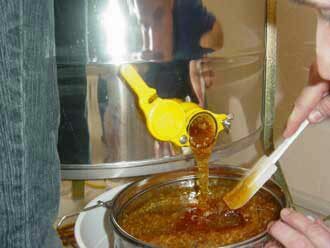 The honey is strained several times and then left to sit for one week. 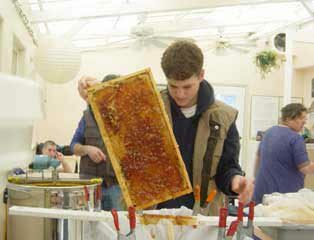 During the week that it sits, air bubbles rise out of the honey completing the process. 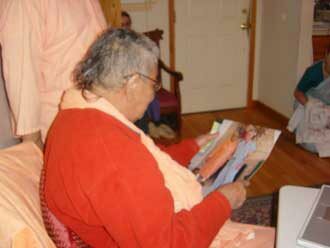 Srila Gurudev is in his room looking at pictures while Hasyapriya Prabhu and the devotees prepare to bottle the honey. Madhumati Didi scoops out the pollen and propolous that has risen to the top of the honey bucket. 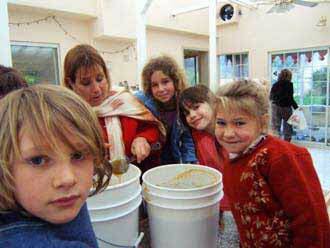 All of the children enthusiastically help bottle the honey. 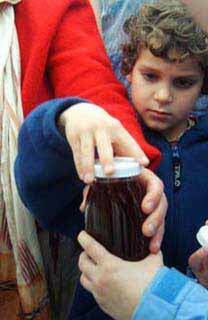 Premananda Prabhu quickly closes the bottle after it has been filled with the strained honey. Madhumati Didi fills the next bottle. 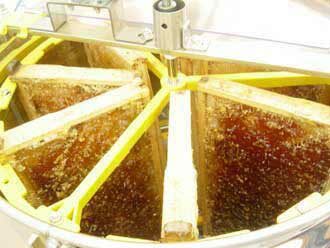 During the straining process, three different grades of honey are produced. 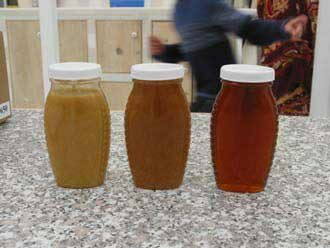 The Seva Ashram's own honey labels are ready to be applied to the jars. Swarnangii Didi designed these labels using a picture of the orchard as the background. A bottle especially for Srila Gurudev! 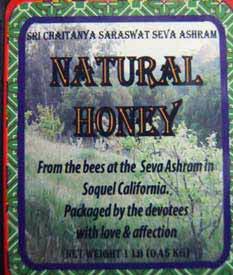 After bottling about forty jars, Hasyapriya Prabhu offers a case of the honey to Srila Gurudev. 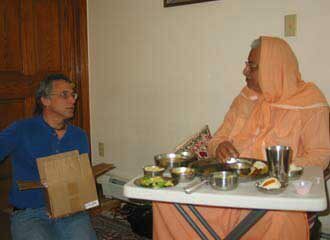 Srila Gurudev accepts the honey happily.